Yep, I'm hopping on the bandwagon. From now until December 24th there will be a new promotion every day, and for that day only. Some will be big, some will be small - and today's is already up! 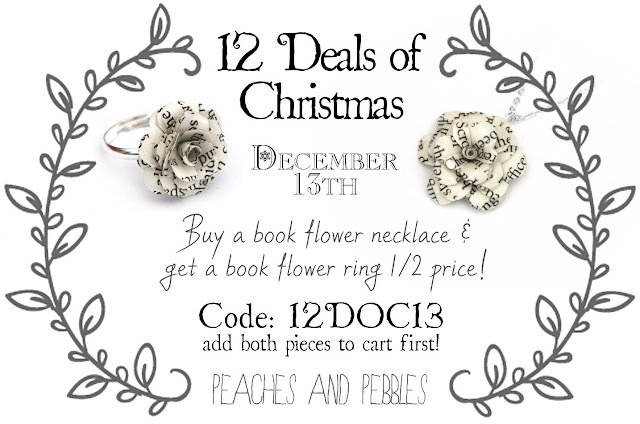 Buy a book flower necklace and get a book flower ring for half price until tomorrow morning! Just add both pieces to your cart, in whichever books you'd like, and then apply the code 12DOC13. And remember: the final order date for the UK in time for Christmas is this Friday!